A revival movement began at the end of the 1980s under the influence of the fall of the USSR, Islamization of state and society, and the Kurdish movement. Breaking the century-old tradition of secrecy, some Alevis have been trying to assert a collective identity and to re-define their place in society, which has resulted in a process of re-construction of community structures, beliefs, and rituals. However, this process became very con-flictual due to the lack of both a binding text and of a central authority able to lead Alevism and to determine its signification. Many intel-lectuals from the newly educated middle class with various ideological backgroundshave been trying to define Alevism, thus com-peting with the holy lineages. As a result, very different conceptions of Alevism coexist nowadays, and are asserted through a selective use of history and traditions: some claim Alevism to be a purely religious matter - a branch of Islam, a religion of its own, or even atheist - while others prefer defining it politically, as a philosophy of resistance, a way of life characterized by tolerance, or the very tradition of democracy. On an ethnic scale, some bring its (Turkish) Shaman features to the fore, while others emphasize the (Kurdish) Zoroastrian elements. Moreover, the fact that this issue has also been argued outside Alevism has increased its politicization. In this context, while many local rituals and pilgrimages are being re-activated, mostly by city dwellers, the main Alevi meeting point and public event, the annual Hacibektaüs festi-val, is far from being a 'traditional' ritual. The dervish lodge at Hacibektaüs, the headquarters of the Bektashi order, was closed - like all Sufi orders in Turkey Ð in 1925. However, the site continued to be a place of pious visits due to both its ritual functions and the location there of the mausoleum of the order's founder, Haci Bektaüs Veli. In 1958, after a relaxation of the anti-religious drive, the restoration of the lodge began, and a museum was opened in 1964 as a result of a local initiative strongly influenced by Bektashi circles. In August of each year since then, ceremonies of commemoration have been held in honour of this saint. The organizers had to deny any religious motives in order to persuade the authorities to allow their 'purely touristic' initiative. Thus, pilgrims come together with folk dancers in 'traditional' costumes of varying degrees of authenticity and folk musicians. In the 1970s, along with a general political polarization in Turkey, the festival organization passed into the hands of young men yearning for radical political change, and left wingers swept in to disseminate their views. 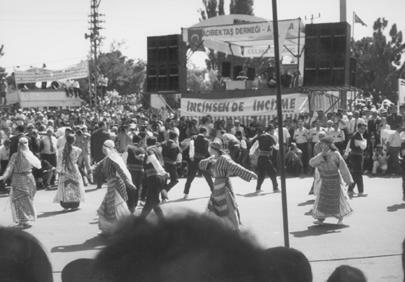 After 1980, the municipality, assisted by the state, took over the responsibility of organiz-ing the festival. More and more ministers and representatives from all parties began attending, making speeches or sending messages - even the President has been attending since 1994. Hacibektaüs has become a place for political bargaining, expressing demands and promises. Alevi associations too have been increasingly active in the festival and use this occasion to mobilize participants and to discuss important issues. The festival has increased in scope with the 'Alevi revival'. Quite interestingly, new pilgrimage practices to Hacibektaş have appeared in recent years. The newspaper Cumhuriyetstated that some 500,000 participants were expected to attend in 1998. As a result, this event has managed to impose its centrality, both within the Alevi com-munity and without. Still, its very develop-ments show its undetermined nature, lying somewhere between a pilgrimage, festival, and commemoration. This imprecision is reflected in the differing names given to it: Haci Bektaş Veli Kültür-Sanat Şenlikleri, Etkinleri, or Anma Törenleri. This indeterminacy also reflects the diversity of actors, activities, and logics coexisting during the festival. Visitors come from all over Turkey, Europe and beyond (many taking advantage of their summer holiday to Turkey), and from very diverse backgrounds - from peasants to the President. In contrast to an in-stitutionalized pilgrimage like the one to Mecca, there is no rigid procedure to be followed and no obligation to visit all sites. Actually, visitors pursue different activities and concerns. Thus, the festival is characterized by a great variety of scenes (both official and un-official), of constituencies and participato-ry modes. The most massive scene is the official opening ceremony, with political speeches and semah (ritual dance) performances, reported by the media on a national scale. But there are many other places with different activities: the lodge/museum, where some 'perform their rituals regardless of curious tourists and the objections of museum officials' ; private houses, where Bektashis from all over Turkey and beyond gather, exchanging news and views; the streets, mainly a place for commercial and political publicity for parties and movements, through tracts and books; ritual places, where sacrifices and 'superstitious' practices are performed by a chiefly rural population; the public seminar rooms, with leading academicians, writers and leaders of associations; the encampments where political groups, mostly illegal leftwingers, dis-seminate their publications in order to recruit without being caught by security forces; and concert halls overcrowded with young people. The divergent opinions on Alevism coexist peacefully during the festival, although most participants are conscious of these differ-ences and criticize the 'others': 'these young people don't even know the signification of the semahthey are performing, they are per-verting Alevism'. Interestingly enough, these differences are rarely publicly expressed dur-ing the event, yet they manifest constantly through private discussions. The lack of consensus concerning the nature of Alevism is covered during the festival by the use of shared symbols - like Atatürk, Ali, Pir Sultan, Haci Bektaüs himself (represented by various sculptures and images), slogans, semahs, and even words like 'Alevi' - since the assertion of Alevism and one's identification with it are more important, in this framework, than the definition of its content. By their very nature as vehicles for simplifying a variety of meanings, symbols are imprecise and thus provide scope for interpretation. Thus, the same symbol may communicate different things to different people, but com-mon affective sentiments towards it create a symbolic consensus. For instance, some may hold the figure of Haci Bektaş Veli because they see in him a religious saint, others because he is a progressive thinker, or a carrier of Turkish values. Symbols are, therefore, ideal media through which people with diverse backgrounds and concerns can speak a 'common' language, behave in apparently similar ways, and participate in the 'same' rituals, for different or even incompatible reasons. In the frame of the festival, the use of common symbols permits the assertion of com-munity. Thus, the diffusion of objects carrying standardized images of Ali or Haci Bektaüs and functioning as signals of identity, as well as their discursive use, do contribute to this assertive process. Further, a symbolic consen-sus on community is created by the folkloristic objectification of culture, and made celebratory through the pastoral allegory of cultural loss and the rhetoric of authenticity. Symbols are used to re-assert Alevi commu-nity and its boundaries when the process of change threatens its integrity, when the actu-al geo-social boundaries are undermined, and especially when its members have been dispersed. Each individual is able to define the community for himself using the shared symbolic forms proffered by the festival. Ritu-al helps in the reconstitution of the communi-ty, because it permits its participants to as-similate symbolic forms to their individual ex-periences and social and emotional needs. In a context of migration and of individualiza-tion and diversification of the constructions of Alevism, the Hacibektaş festival is a prime occasion where the Alevi community is as-serted both on a collective and on an individual level. Public folklore, as the representation of folk traditions in new contexts, is used to symbolize Alevi identity to oneself as well as to others; thus, public ritual also serves to reformulate values and self-definitions and to negotiate the relationships with these 'others'. Actually, the festival is, through its centrality and media publicity, the main public point of representation of Alevism to the outside world and, through its politicization, of negotiation of public space for Alevism in Turkey. Although the multi-vocality of the event permits diverse participants to communicate with different outside audiences, the public negotiation of Alevism with these audiences as transmitted by the media is quasi-monop-olized by state agents, who also use celebra-tory and symbolic language in order to gain a large audience. Alevism is officially interpret-ed as a tolerant form of Islam reduced to its folkloristic characteristics and is presented as being in keeping with the republic. Haci Bektaş is presented as a stateloyal figure as-sociated with Turkism, which provokes protests against political recuperation of the festival and of Alevism. Many Kurdish Alevis, refusing the assimilation between Alevism and Bektashism, boycott the event. Thus, Hacibektaş is also an occasion where the image of an inclusive, tolerant state is created, for which Alevism is a source of authentic-ity and Turkishness and a resource against Is-lamist and Kurdist movements. But on the offscenes, competitive interpretations of Alevism and (both symbolic and real) articulations with the rest of society are proposed. 1. Bauman, G. (1992), 'Ritual implicates "Others":rereading Durkheim in a plural society', in: D. de Coppet (ed. ), Understanding Rituals, London: Routledge, pp. 97-116. 2. Norton, J. D. (1992), 'The development of the annual festival at Hacibektaüs 1964-1985', in: A. Popovic, G. Veinstein (eds.) 'L'ordre mystique des Bektachis et des groupes relevant de Hadji Bektach', Revue des etudes islamiquesLX (1), pp. 187-196. Elise Massicard is a PhD candidate in Political Science at the Institut d'Etudes Politiques, Paris, France, and a research fellow in the working group 'Transplanted Islam, Migrations' at the Centre Marc Bloch, Berlin, G e r m a n y .